John was a three-time All-Ivy selection from 1983-86. After missing the 1985 season due to an ACL tear, he became the second leading scorer for the team in 1986, earning him first team All-American honors. In 1984, he led the Crimson to the New England Championships and to the quarterfinals of the NCAA tournament, marking the Harvard's furthest advance in the NCAA tounrament in 12 years. John improved on that feat by leading the Crimson to the National semifinals in 1986. I feel honored to be inducted into the Harvard Varsity Club Hall of Fame. To be included amongst members with such great athletic ability, into an institution with such rich sporting tradition, is indeed a privilege. I feel lucky even to have attended Harvard College, let alone to accept this accolade, and I would like to thank the Harvard Varsity club for this recognition. I transferred to Harvard as a sophomore, missing out on my freshman year of discovery and orientation, and lived off-campus for most of my time in Cambridge. As such, sport became my vehicle for meeting friends initially, and my afternoons in and around Dillon Field House provided an extra-curricular structure that was as welcome as it was necessary. From the first days of pre-season training in that summer of 1983, the men’s soccer team gave me a focus and outlet for all of my non-scholastic energy. My coming to Harvard was interesting in its own right, as I initially thought I was contacting Stanford University when I called the number an acquaintance had given me to inquire about admission to the College. The 617 area code meant little to a teenager from Canada, and as it turned out, my contacting the Athletic Department, instead of vice versa, preserved my athletic eligibility as a non-recruit during that first year, and this played a large part in forestalling a professional soccer career that I felt committed to following. My contact that day was Coach Shattuck, and I must thank Jape for both guiding me through the transfer admission process, and for making my time at Harvard one that was both compelling and fulfilled from an athletic sense. From all of my days in soccer, I can honestly say that I have never had a coach that displayed the professionalism and technical expertise that Jape did. His handling of the many problems I had with the NCAA, over eligibility rules more suited toward football and basketball, was always transparent, ethical, successful, and much appreciated. Much to coach Shattuck’s chagrin, I chose to play rugby during the spring semester, and my inclusion in this team allowed me to meet an entirely new set of team-mates. Although it was not a varsity sport at Harvard at the time, and so not able to attract as many athletes or as much funding, our team in 1984 was quite balanced. We advanced from regional qualification to inter-regional play, winning all our games and advancing to the final four in California. Our travel to that tournament, and success in winning the National Championship against some stiff competition, still ranks as one of my favourite athletic memories. 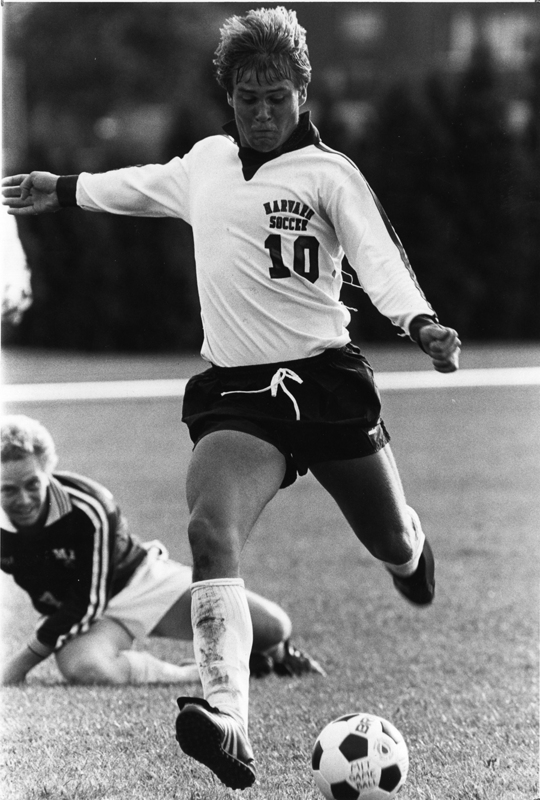 My personal success with Harvard soccer attracted the attention of the Canadian Soccer Association’s National Team coaches, and I owe a great debt of gratitude to all of the team-mates and coaching staff with which I played. Our varsity teams had many exceptional players, and they should share this award with me. I have always played team sports, and believe strongly that individual distinction should be looked upon as team honors first and foremost. I had the great fortune to play in the Los Angeles Olympics in 1984. Imagine my surprise when the Canadian Soccer Team was drawn into a group that would play its group stage at Harvard Stadium. Returning after my sophomore year, staying in Adams House with the teams from Cameroon, Iran and Iraq, attending our own opening ceremonies in the stadium, and advancing to the quarterfinals was another memorable chapter in my Harvard athletic career. I can only wish that the varsity team got to play all of our games in front of those large crowds on an immaculate pitch converted from its normal gridiron. I suffered a serious knee injury while playing soccer for Canada in Honduras in the summer of 1985, just before the start of the varsity soccer season. In a cast for five weeks, and hobbling to class on crutches for over three and a half months, I came to know the trainer’s room at Dillon Field House in a new light. During that time, I spent many hours of therapy with our trainer, Henry Jannergren, and his up-beat attitude and encouragement got me through the first major hurdle I had had in my sporting life. I owe him a big thank you for this award, and I know that he is still smiling down on me today, as he did so often on the trainer’s table. My final debt of gratitude goes to my family. Firstly, my parents, who experienced great financial sacrifice to send me to Harvard, and who encouraged and allowed me always to follow my dreams, even when they meant leaving after graduation for England to apprentice as a professional “footballer”, having just contributed so much to my education at Harvard. Soccer and education do not go hand in hand in England, but their unwavering support allowed me to pursue a professional soccer career that spanned over a decade and included many team championships and individual records. Secondly, to my two older brothers who guided me into sport from a very early age. Lastly, and most importantly, to my wife Sarah, who, for over twenty years, has put up with, and still puts up with, my addiction to “the beautiful game”. Now, as we settle into our new life in Munich, Germany, with our three sons, we are closer than ever to the cradle of world soccer, but I still look back to my days at Ohiri Field with a fondness and nostalgia, as the time and place where I came of age as a sportsman. Many thanks to the Harvard Varsity Club for this prestigious award, and for allowing me to rekindle those fond memories.